When you drive into our site, you will catch a glimpse of the ironstone quarry, the massive excavators and the rail system that is the leading feature of the Museum – you will see it in detail later! Parking your car on the site of the Ore Mining Branch sidings, our entrance is flanked by a range of excavator grabs, dragline buckets and crane hoists reminiscent of the mechanical heritage of the area. Your visit starts at the centre of the 15-acre open air Museum with a welcoming café, Museum and orientation exhibition all setting out to let you decide what to explore first! Our Museum exhibition explains the geology of the east midlands ironstone field and the history of modern extraction through the four local systems which together chart the various techniques, the mechanical means and most importantly, outlines the people who worked in the industry. We recall the legacy of the Victorian narrow-gauge Cottesmore Mines, the privateer overland Market Overton system, the Edwardian Dorman Long system at Burley and the final developments at Exton Park, all linked to our site and the local community. Our Museum features a working model of the local iconic landmark – the electric dragline excavator SUNDEW. 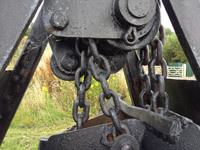 Visitors can choose between a range of experience tours around the Museum site. 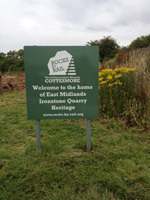 We hope that most will first choose to visit our Quarry Trail, past the lorry tip dock and the narrow gauge railway remains up to the elevated viewing area above the operational ironstone quarry. Visitors will see the excavators busy attending to the rock face and quarry trains – our guides will explain the geology and working methods before you visit the quarry floor when active working takes a break. We offer a nature trail that follows the branch line toward Ashwell Junction and where you can enjoy the rural tranquillity of the Rutland countryside. The trail is inhabited with local species and plays host to a range of native wildlife. We often see Red Kites soaring the thermals off the escarpment while deer, hares and pheasants wander unchecked. Our trail allows good photographic opportunities for the passing trains, a picnic spot for family visitors and will shortly link to the passenger platform at the end of our mile long line. The trail crosses the course of The Oakham Canal, which we have opened out in conjunction with The Melton & Oakham Waterway Society to allow standing water most of the year. Visitors can imagine a busy towpath some 200 years ago, well before the railway came to the area. Returning to the central area, we have our locomotive exhibits displayed in the loco yard behind the platform where you will see many of the locos from local quarries, many operational and others awaiting their turn for restoration. The locomotive shed, in itself a historic survivor from a local quarry railway, is open for visitors to inspect the exhibits under restoration – these regularly change and our enthusiastic volunteers will be pleased to tell more about the work and the history of the exhibits. Fancy a ride? – then head for our new passenger platform for brake van trips on operating days. We offer printed tour route guides to allow visitors to trace exhibits from specific era, locations or themes – just ask at our reception area and we would be pleased to assist. ENJOY YOUR VISIT.